Whether it’s your car, truck, bike, trailer, or van, we want to get you back on the road with a new coat of paint that looks spectacular. At Autobahn Collision Center, we know that the paint on your vehicle isn’t just for show — it also protects the metal underneath. 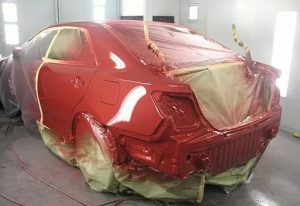 When you have a section of paint missing, it can make your car susceptible to damage. Allow us to take care of the issue and get you on your way. We use the highest quality paint in the industry and apply it using top-of-the-line technology. Our painters have years of experience and they perform every job as if they are working on the most important vehicle in the world. The end result is a stunning paint job that will last as long as you own the vehicle. If, for whatever reason, you need it touched up, we will do so free of charge, thanks to our lifetime guarantee. With custom paint restoration services and more than 20 years of experience, we know we are the auto body repair team for the job. We take pride in offering quality work at a fair price. With no appointment necessary, we encourage you to stop in today or reach out with any questions you may have.